Four Endeavor Entrepreneurs from four different continents shared how their companies are contributing to improve a world in which technology is increasing quickly and exponentially. Endeavor Entrepreneurs Reynazran Royono (Indonesia), Lucía Iborra (Spain), Guillermo Jaime (Grupo MIA) and Martín Frascaroli (Argentina) during the INCmty High Impact Entrepreneurship Summit in Mexico City. In a changing world where technology is increasing exponentially and is becoming more available to larger amounts of people, we need to disrupt the existing concept of an entrepreneur. Only then will a new generation of entrepreneurs be able to bloom; one that uses technology and data to help create successful companies that also have a positive impact on the planet. 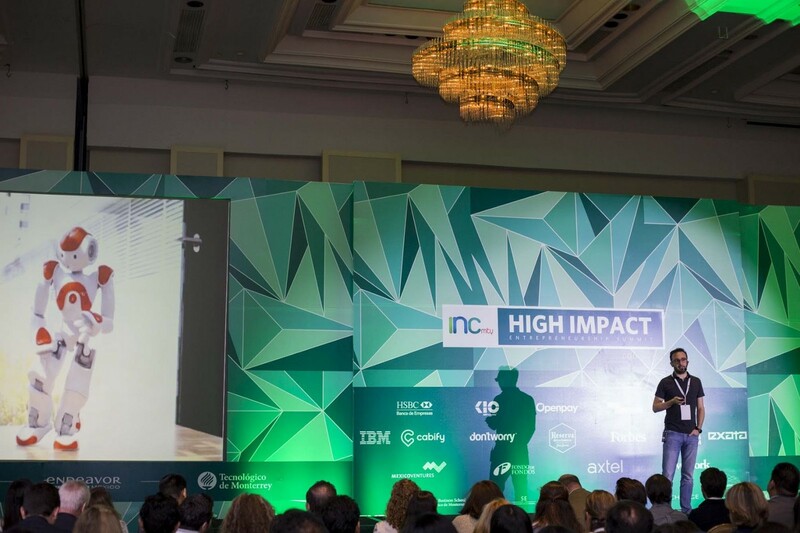 The INCmty High Impact Entrepreneurship Summit, organized by Endeavor Mexico and Tecnológico de Monterrey, took place on May 22 and 23rd in Mexico City with this disruption in mind. On the Summit’s second day of events, key players of the Mexican entrepreneurial ecosystem gathered to discuss some of the global trends related to High Impact Entrepreneurship. Four of the eleven speakers were Endeavor Entrepreneurs. They are all examples of this new generation of entrepreneurs: besides sharing Endeavor’s worldwide mission, they also have in common a broader vision for their companies. They want to generate revenue and be financially successful, but at the same time they are fully committed to benefit the ecosystems that surround them. When talking about the Future of Transactions, Reynazran Royono, founder and CEO of Snapcart and an Endeavor Entrepreneur from Indonesia, explained the impact that big data already has in retail. “Those who can leverage big data will be the winners”, he said in the closing remarks of his presentation, which centered around how offline companies can retrieve data to optimize their products and services. 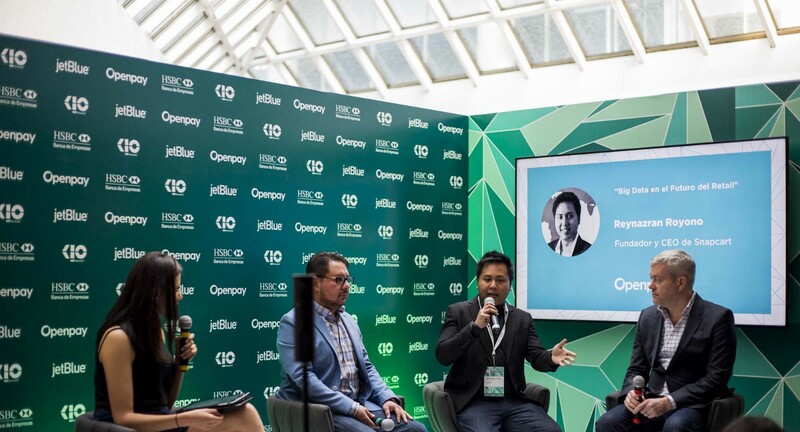 Royono in the Q&A Session with Porter Erisman, former VP of Alibaba, and Eric Núñez, Openpay’s COO. Automation was discussed as the third topic. Martín Frascaroli, CEO of Aivo and an Endeavor Entrepreneur from Argentina, talked about how artificial intelligence has transformed customer service. “What the customer really wants is that his or her problem is solved immediately. Somehow, this was lost among customer service specialists.” Aivo uses machine learning technology to power a smart algorithm for customer service. Martín’s company is one example of how AI is becoming more present in the job market. Frascaroli during is talk about AI and customer service. The final topic discussed in the Summit were the Challenges Ahead. For the most part, these challenges will be more present in the years to come as the world keeps changing. Lucía Iborra, an Endeavor Entrepreneur from Spain, described some agricultural processes that are being optimized with high tech. “In 20150, the world will have 9,7 billion people. We have to guarantee food security for all of them.” To do that, Lucía’s company VisualNAcert is using drones, augmented reality and satellite maps in Europe and America. Day two of the INCmty High Impact Entrepreneurship Summit brought together more than 600 attendees. Other businesspeople and visionaries shared their perspectives, including Hollie Delaney, Head of People Operations of Zappos.com, Porter Erisman, former VP of Alibaba, and Constanza-Gómez Mont, Head of PIDES Innovación Social and cofounder of Nutrigene.